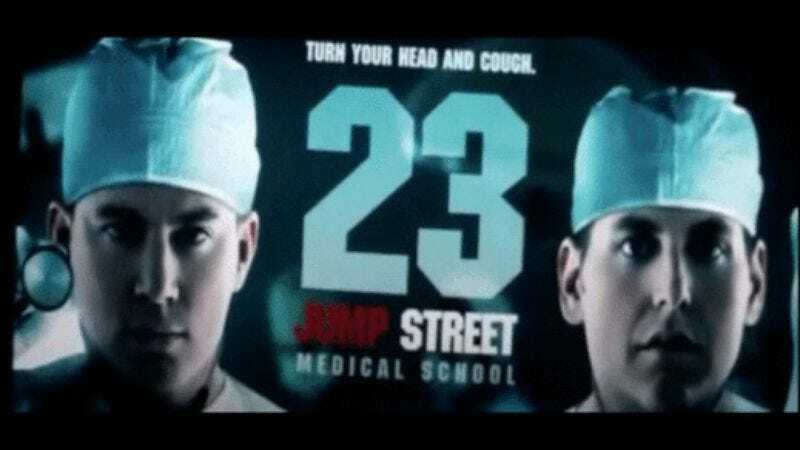 Turning self-deprecating jokes into actual ones in the spirit of the franchise, 23 Jump Street is now officially being readied at Sony, much as the closing credits of 22 Jump Street predicted and/or openly mocked as a sign of creative bankruptcy. But such self-awareness continues to be the series’ saving grace—and 22 Jump Street made an assload of money—so writer Rodney Rothman has been set to return to script the next installment, which may or may not take place in Medical School, as sort-of-jokingly-but-maybe-not teased in that montage of sequels at the end. Also unclear as yet is whether directors Phil Lord and Christopher Miller will return to direct, though Deadline says they are currently “overseeing” the development of the script alongside Jonah Hill and Channing Tatum, who are presumably still planning to star. Anyway, perhaps 23 Jump Street could instead send their characters to film school, where they can make a movie about their experiences in 21 Jump Street that becomes a fluke success necessitating a sequel, and then we can just keep going around and around like this for the next decade or so.